With more financial consumers going digital than ever before, delivering a great online experience to current (and prospective!) customers has become increasingly important. So what makes for a great user experience? Take a look at our recent redesign of BNB Bank’s website. Its intuitive, conversion-driven approach incorporates the latest in best practices. The website delivers a personalized experience—the home page imagery even changes based on a visitor’s IP address and relevant content is dynamically served to each visitor. Content is interest-focused and informative. It keeps the “hometown bank” feel of BNB, showcasing the brand and acting as an extension of the physical branch locations. More than half of banking customers use mobile devices to interact with their financial institutions so gone are the days of huge menus and endless copy. From the BNB home page, you can easily navigate to business or personal banking, or log in to the online banking platforms. Iconography showcases the bank’s product offerings and a prominent search bar on every page allows you to find exactly what you’re looking for in one or two clicks. Throughout the BNB site, visitors are encouraged to begin building their relationship with the bank (rather than just open an account) via a simple form that is convenient and user friendly. Many visitors are, in fact, using it: Since the website launched in June, it’s delivered a conversion rate 50% higher than the previous version. Bnbbank.com also incorporates integrated marketing automation to move current and prospective customers along the conversion funnel. With the substantial increase in ADA compliance lawsuits—and financial institutions as prime targets—making sure your website is ADA compliant is vital for your bank and your customers. This site is built to comply with Americans with Disabilities Act (ADA) Title III via the Web Content Accessibility Guidelines (WCAG 2.0). 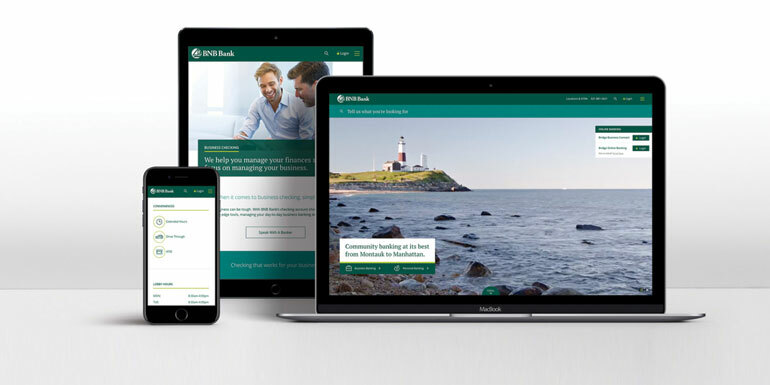 BNB’s redesigned website takes this leading community bank’s digital presence to the next level, keeping its local, hometown feel while delivering the leading-edge online experience today’s banking consumers demand.